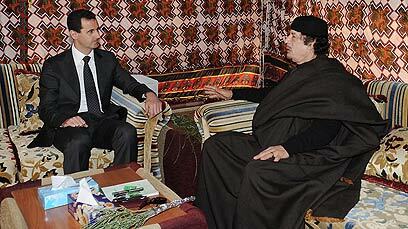 Syrian President Bashar Assad met Sunday afternoon in Tripoli with Libyan leader Muammar Gaddafi. Official Syrian news agency SANA reported that the two leaders stressed during the meeting that Arab countries must overcome their differences in order to promote their shared interests. "The challenges facing the Arab nation, and especially the oppressing blockade imposed by the Israeli occupation authorities on the Palestinian people in the Gaza Strip and the obstacles placed by Israel ahead of achieving peace in the region, obligate all Arab countries to overcome the differences and stand together in a way which will boost the joint Arab activity," the two leaders said in a joint statement. "We must leave the next Arab summit with results which will serve the Arab interests and realize the aspirations of the Arab people," they added. The meeting between Assad and Gaddafi was held on the backdrop of preparations for the next Arab summit, which will be held in the Libyan capital in March. According to the Syrian news agency, the two leaders discussed the situation "in the occupied Palestinian territories and the conflict between the Palestinian factions." They agreed that there was a need to reach an intra-Palestinian reconciliation, which would help bolster the Arab stand in the face of "the reckless Israeli steps against the Palestinian people." Assad and Gaddafi also agreed to cooperate on a variety of issues and to strengthen the diplomatic and economic relations. They agreed to found a joint strategic council which would promote the bilateral relations between the two countries in all areas. The meeting with also attended by Syrian Foreign Minister Walid Moallem, the Syrian president's political advisor Bouthaina Shaaban, the Syrian ambassador to Libya, Libyan Revolution Leadership member Major General Mustafa al-Kharroubi and other Libyan officials. See all talkbacks "Assad, Gaddafi say Arab countries must unite against Israel "